The formula stands on two ratios. First, the company's EBIT as a proportion of its net fixed assets plus net working capital and second, the company's EBIT as a proportion of its enterprise value. On Wall Street, Joel Greenblatt was known as a legendary stock-picker. His hedge fund, Gotham Capital, gave an average return of 50% a year over ten years. In fact, when he published his first book, 'You Can Be A Stock Market Genius', many hedge funds claimed they were following his approach. Then, he wrote his second book, 'The Little Book That Beats the Market', for small investors, in which he gave a simple methodology for picking stocks. He called it the magic formula. The formula stands on two ratios. First, the company's earnings before interest and taxes (EBIT) as a proportion of its net fixed assets plus net working capital; this ratio is akin to adjusted return on capital employed (RoCE). Second, the company's EBIT as a proportion of its enterprise value; this is akin to earnings yield adjusted for capital structure. "I came across Joel Greenblatt's book while teaching myself value investing," says Madhu Gumballi, a software engineer and an active investor. He used to make two lists of stocks, one on the basis of earnings yield and the second on the basis of RoCE, and finally a third one adding rankings from the earlier two lists. "I used this formula during the initial days when I was learning investing, although now I focus more on qualitative aspects of companies than quantitative aspects," says Gumballi. One way to build a portfolio is to buy the top stocks ranked according to the magic formula. Gaurav Mehta, vice president, Institutional Equities, Ambit Capital, says that quality of earnings and corporate governance are key to alpha generation in India. "Hence, it is important to weed out value traps, that is, firms with suspect corporate governance or accounting." The magic formula is just one step. Investors need to do due diligence on stocks that clear the magic formula test. Sustainability of the business and management quality are absolutely essential. Stock-picking can be subjective and depend upon the individual's understanding of the company/sector and his risk profile, says Gumballi. "In my case the portfolio has evolved from diversified to concentrated." The magic formula suggests that one must look at the top 20 stocks, but Gumballi suggests that one must pick 10 (looking at qualitative aspects) and allocate equal money to each of them. "Also, I would retain my winners as long as fundamentals remain good and there are no industry headwinds," he says. "Greenblatt tried to merge Ben Graham's preference for cheap stocks and Warren Buffett's preference for high-quality companies. That is why he suggests ranking companies with the best possible combination of earnings yield and return on capital," says Tanushree Banerjee, Co-head of Research, Equitymaster. Banerjee says investors should also take into account profitability and debt to equity ratio. They should also assess whether the company has sufficient moat and management strength. Moat is the competitive advantage one company has over others in the same industry. "Importantly, as Greenblatt suggests, as and when the stocks become expensive, investors should also consider booking profit," she says. "I like the simplicity of the formula but as you add years to your investing life you have to look beyond it. Nevertheless, it is very useful for beginners," says Gumballi. Excluding financial, commodity and cyclical companies, the formula can work in India as well, says Sankaran Naren, CIO, ICICI Prudential AMC. Using the formula is tedious as an investor is expected to buy 15-20 stocks and then rebalance the portfolio every year. Not everyone uses the entire formula. Sumedh Kadoo, co-founder, Craytheon Financial Services, says, "We at Craytheon follow a different approach-buy profitable companies and hold them for long. I think this strategy makes sense for other Indian investors too. They can use the second part of the formula to find out the most profitable companies and then invest in them when the market crashes or their share prices fall due to some temporary bad news. Once you buy the shares, hold them for the long term." "One basic learning of behavioural finance is that we are sometimes more focused on stocks which have done well and are highly valued. Greenblatt ensures that we are fond of companies which are high quality and cheap," says Sankaran of ICICI Pru AMC. Kadoo of Craytheon says, "The partners at Craytheon use just the second part to calculate the RoCE of Indian companies and rank them from most profitable to least profitable." He says top 30 companies are studied further. "We then create a smaller list of companies whose business we understand and buy those we think are undervalued or fairly valued," he says. Banerjee of Equitymaster says, "We do not use the formula in isolation. Instead, we screen stocks through various valuation metrics, besides other fundamental ratios." Equitymaster takes into account both earnings yield and RoCE, as suggested by Greenblatt. "The only adjustment we make is that we look at only companies whose market capitalisation is more than Rs 250 crore," says Banerjee. Ambit Capital has also modified the criterion. Mehta says, "The difference between our and Greenblatt's approach is that while he adjusts for cash and looks only at returns on invested capital, we look at returns on total capital including cash (by including cash income in the numerator). This penalises firms which hoard cash as high cash balances lower their RoCE." 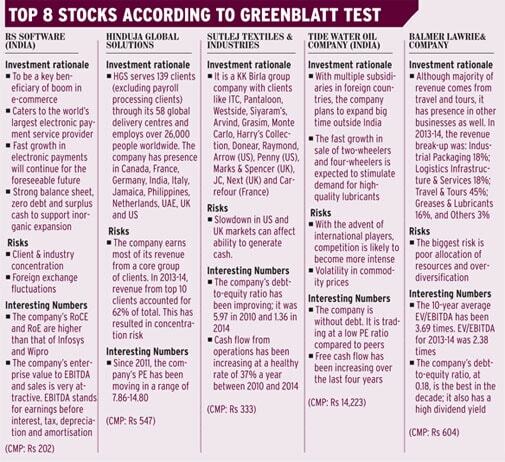 The companies are ranked on these two parameters. After this, the list is merged to arrive at a cumulative rank. This makes sure that companies which get high scores have high return ratios as well as low valuations. On use of the formula in the Indian scenario, Naren of ICICI Prudential says, "India has a number of cyclical sectors and that is why there are constraints in using this methodology." Although the strategy works over the long run, there are periods when it doesn't. This is, of course, true of many value-oriented strategies. Mehta explains. "We believe value investing works when the macro environment is conducive. In challenging times, investors flock to safety even if it is expensive and so valuations become secondary." To the extent that a revival of India's macros looks likely, a value-oriented approach like the magic formula may work now. Graham's Magic Multiple is the multiple of a stock's P/E and P/BV. Graham has put an upper limit to the output of this ratio--22.5. This he derived using maximum P/E of 15 times and maximum P/BV of 1.5 times, the highest multiples he was ready to pay for a stock. P/BV is used to compare a company's market value to its book value.